Arsenal boss Arsene Wenger says Aaron Ramsey could be out for up to a month and suggested that playing for Wales contributed to his hamstring injury. 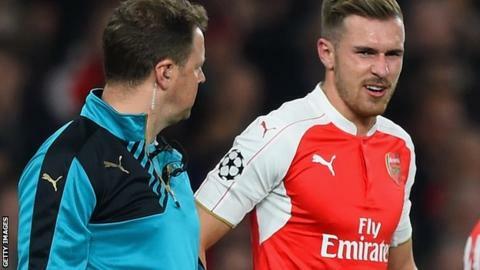 Ramsey came off during Arsenal's 2-0 Champions League win over Bayern Munich on 20 October, having played 90 minutes against Watford on 17 October. The midfielder played in Wales' Euro qualifier with Andorra on 13 October. "The fact that he played against Andorra certainly cost Gareth Bale and him [Ramsey] as well," Wenger said. Wenger, speaking to the Arsenal website, said Ramsey could miss Wales' friendly with Netherlands on 13 November. "He had a scan today but he's out. I believe he will be out until after the next international break," Wenger added. If Ramsey's problem is as serious as feared, the 24-year-old will also miss Premier League games against Everton, Swansea and Tottenham, the League Cup fourth-round tie at Sheffield Wednesday and the return Champions League match at Bayern Munich. Wenger had previously confirmed that Ramsey would miss Saturday's game at home to Everton. Ramsey's fellow Wales star Bale has been troubled by a left calf injury for some time. He came off in the La Liga win against Levante at the weekend and sat out Real Madrid's Champions League 0-0 draw at Paris St-Germain on Wednesday. Do Arsenal have an underlying problem? Ramsey's career has been blighted by hamstring injuries and he was sidelined on three separate occasions during the 2014-15 season. Former Wales and Netherlands assistant coach Raymond Verheijen said he believes that the Arsenal squad is prone to injuries. He told BBC Wales Sport: "If you analyse the situation at Arsenal, you see there is this group of young players like Theo Walcott, Jack Wilshere, Alex Oxlade-Chamberlain - Bacary Sagna and Robin van Persie when they were there - Aaron Ramsey and now also Danny Welbeck. "These are players who, every year, are out for numerous weeks or months and that is a big concern. "It tells you something is going wrong at Arsenal in terms of over-training these young players. As a result, their bodies are breaking down. "If you want to know what exactly is going wrong, you have to be there every day to see what they do. "From the outside, you can only draw the conclusion something is going wrong." There was no official response from Arsenal, but manager Wenger will hold his usual media conference on Friday morning.